When I see webpages for small production houses, I often see photos of “the studio” – sometimes these studio photos are hard to believe. I don’t know whether it’s just me being cynical, but sometimes (definately NOT always) these studio photos are “the dream studio” …not the real thing ! 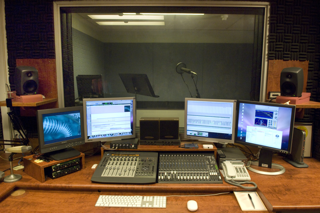 Personally I work from a variety of studios – some at radio stations or production houses, and sometimes from my home studio (which is the spare bedroom – nothing flash but it works!). In recent times I have been investigating other options, from a small space downtown that I could treat, to an old bank vault. But after some negotiation, I have made arrangements to hire a very nice studio space for a couple of hours a week, particularly for longer voice jobs. I will use this studio for voicing – then edit in the home studio. The studio is very well equipped with a ProTools 8 HD system, a variety of microphones (including several of my favourite mic – the Sennheiser 416), a booth with floating floor, quiet air con, Genelec monitors and very nice sound proofing. When the studio was built some ten plus years ago – it was exceptionally accousticly designed specifically as a Voiceover studio. It has seen several equipment incarnations, to it’s current state with the above equipment list. … I think I’ll enjoy working in this studio a couple of hours a week. Nice set up. I like that mic, too. This is an alternative I never thought of in this manner! Seems like a good way to go. Certainly cost-effective. Nice rig Jas.